1774-1824. He was the second son of Ralph Collier, the chief clerk to the Victaulling Board, and of his wife Henrietta Maria Jackson, the daughter of an Amsterdam merchant. After an education at the Chelsea Maritime Academy, Collier entered the navy in January 1787 aboard the Carysfort 28, Captain Matthew Smith, serving in the Mediterranean. He was employed in the summer of 1790 aboard the Salisbury 50, Captain Edward Pellew, the flagship of Vice-Admiral Mark Milbanke at Newfoundland, and in December that year joined the Victory 100, Captain John Knight, before moving in March 1791 to the Juno 32, Captain Sam Hood. Upon leaving the Juno, and having passed but not been commissioned lieutenant, Collier undertook service in the East India marine, and on 3 September 1792 suffered the misfortune of being wrecked in the Mozambique Channel. He and his surviving shipmates spent nearly eight months with the natives on Madagascar before being taken off by a Portuguese vessel, but that was not to be the end of their tribulations, for a French privateer captured their saviour and another year’s incarceration as a prisoner of war resulted on the Isle de France. Towards the end of 1794 he was released and made the best of his way to Madras where he joined the Suffolk 74, the flagship of the commander-in-chief, Commodore Peter Rainier, and later a private ship under Captain Robert Lambert. Having been rated midshipman in June 1795 he was appointed to command the Suffolk Tender a month later as an acting-lieutenant, which rank was confirmed with seniority from 22 January 1796. This vessel was condemned after undertaking a voyage to the Cape, and upon returning to Madras Collier was advised that it would be in the best interests of his career to set forth for England in order that his conduct could be rewarded with promotion. He eventually arrived home in May 1799 and was soon appointed lieutenant aboard the Zealand 64, Captain Thomas Parr, before removing at the end of July as the first lieutenant to Vice-Admiral Sir Andrew Mitchell’s flagship the Isis 50, Captain James Oughton, and serving in the invasion of the Netherlands between August and October. Accorded the honour of being sent home with despatches, he was immediately promoted commander with seniority from 3 September by Lord Spencer, the first lord of the Admiralty. After joining the sloop Victor 18, he returned to Sheerness from a cruise in December, and during the late summer of 1800 was in the Baltic collecting a convoy at Elsinore, prior to returning home where his command began fitting out at Sheerness for the East Indies. The Victor arrived in India during 1801 and she conveyed troops to the Red Sea for participation in the Egyptian campaign that had commenced with the Mediterranean Fleet’s landings in March. Returning to the Indian Ocean, she fell in with the French sloop Flèche 18, Captain Eustache Bonamy off the Seychelles on 2 September, but after the briefest of engagements her opponent fled. Following repairs, the Victor came up with the Flèche off Mahé three days later as she was on the verge of entering that harbour. A two and a half hour action ensued, with both ships anchored before the French vessel cut her cable, drifted on shore, and was set on fire by her crew. Collier sent his own men across to try and save the sloop, but they were unable to do so before she rolled over and sank. As soon as the despatches announcing his defeat of the Flèche were received at the Admiralty by a delighted Earl of St. Vincent in July 1802 Collier was posted captain, and he was additionally honoured by his promotion being back-dated to 22 April, thereby placing him higher on the Captain’s list than at least seventy other officers who had been posted captain on 29 April in celebration of the peace and their service during the French Revolutionary War. In the meantime Collier had assumed command of the Leopard 50, which he brought back to Portsmouth from the East Indies on 24 February 1803. Following the recommencement of war with France in 1803 he was unable to find any active employment, despite the newspapers reporting in September that he had been appointed to the Champion 24, which vessel had been overhauled at Chatham, and that in 1804 he would be joining the Leander 50, flagship of Admiral Sir Andrew Mitchell at Halifax. In the event he was disappointed of both these commands and instead commanded the sea fencibles at Liverpool until January 1806. 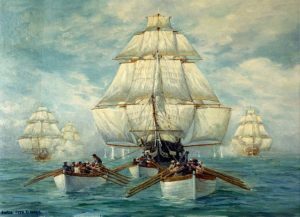 In early 1806 Collier returned to sea upon his appointment to the newly commissioned twelve-pounder frigate Minerva 32, and he enjoyed much success against the enemy, particularly on 27 April when he captured the Spanish privateer Finisterre 14 off Cape Finisterre, and on 22 June, when the men from two of his boats seized a fort, spiked its eight guns, and brought out five coasters. On 9 July his barge was sent to run down some La Guardia privateers operating north of Oporto, and upon discovering the lugger Buena Dicha 1 the crew carried her after covering forty miles at the oars. On 29 September his cutter cut out two chasse-marées from Pontevedra, north off Vigo, and on 3 October he led an attack on a Spanish gun-boat in Arosa Bay, capturing a launch with a four pound cannon which she had in attendance. On 22 April 1807 Collier was appointed to the eighteen-pounder frigate Surveillante 38, and he commanded her during the expedition to the Baltic which forced the capitulation of Copenhagen on 7 September, following which he arrived at the Admiralty on 16 September with Admiral James Gambier’s despatches and was knighted that afternoon by the King. Serving thereafter in the Channel, his command nursed the Orion 74, Captain Archibald Collingwood Dickson, back to Plymouth in November after she had grounded off Lorient. In January 1808 the Surveillante went out to Brazil with a diplomatic legation, arriving at Rio on 11 March and remaining on that station under the orders of Rear-Admiral Sir William Sidney Smith. Here off Rio she captured a valuable Danish East Indiaman that had sailed from Lima, and which was carried back to Portsmouth by a prize crew to arrive in November. The Surveillante returned to Falmouth on 11 March 1809 with a convoy, and going around to Portsmouth she was quickly fitted for sea before departing on 15 April for Portugal, giving passage to the commander-in-chief designate, Lieutenant-General Sir Arthur Wellesley and his staff. She then embarked Wellesley’s predecessor, Lieutenant-General Sir John Craddock and his suite at Cadiz and delivered them to Gibraltar on 2 June before returning to Portsmouth at the end of July. At the beginning of September the Surveillante went out on a cruise off Lorient, and after capturing the French corvette Milan 18 bound for Guadeloupe with despatches in the Bay of Biscay on 30 October she took the Rochelle-based privateer cutter Countess Laura 16 on 3 December. On 5 September 1810, being in company with the Constant 14, Lieutenant John Stokes, she prevented a French convoy from coming out of the Morbihan. Collier then sent his boats in under the covering fire of his consort to cut out a merchant brig that had sought shelter between the batteries of St. Gildas and St. Jacques in Quiberon Bay, and on the next day two of the boats destroyed a battery at the mouth of the Crache. A further capture on 1 May 1811 was the French privateer Creole 14. The U.S.S Constitution in an earlier chase. Collier’s failure to capture her in 1815 would have tragic consequences. During 1812 the Surveillante formed part of Commodore Sir Home Riggs Popham’s squadron on the north coast of Spain, where at the end of July Collier was wounded during an attack by Spanish patriots and the marines of the Surveillante and Magnificent 74, Captain Willoughby Thomas Lake, on Santander and the castle of Ano. Although the latter was taken, nothing could be done to force the French out of their garrison and the naval force was therefore withdrawn. On 3 August the French withdrew of their own accord and the marines marched in to take possession. 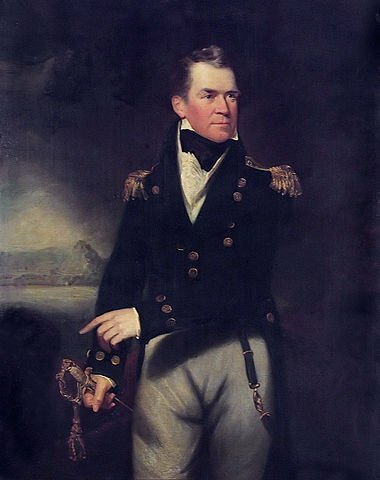 In 1813, with the rank of commodore, Collier held the command of the squadron operating with the patriots, and he assisted the army reduce San Sebastian in a campaign lasting from July to September, following which he was temporarily replaced by Captain Edward Tucker in command of his frigate. After returning home the Surveillante was paid off in November and broken up. Having originally been appointed to the new super-frigate Newcastle 50 in November 1813 Collier relinquished the command to Captain Lord George Stuart in the following month and was instead appointed to the new super-frigate Leander 56 in February 1814, these vessels having been specifically built to tackle the huge American frigates. Sailing from Portsmouth on 16 March, he collected convoys from Guernsey and Cork before heading for North America where on 22 June he captured the American naval vessel Rattlesnake 16, and on 8 November the privateer schooner General Putnam 8 off Cape Sable. In the meantime he had been created a baronet by the Prince Regent on 20 September. During 1815 Collier’s frigate blockaded the Constitution 44 in Boston, being in company with the Newcastle 50, Captain Lord Stuart, and Acasta 40, Captain Alexander Robert Kerr. Following the American frigate’s break-out and engagement with the sloops Levant and Cyane on 20 February, Collier hunted her down to the Cape Verde Islands, but on 11 March she escaped his clutches following a chase, although the Levant was re-taken. This failure to take the Constitution would have desperate consequences for Collier. The Leander then returned with a troop convoy to England in July. Collier was created a K.C.B. on 2 January 1815, and in 1818, having been appointed commodore of the West Africa squadron, he fitted out the Tartar 36 with many eminent young men joining her as midshipmen. During the next three years he attempted to restrict the slave trade on that coast, but this was an almost impossible task to undertake given the few ships at his disposal, although he did send home despatches that were laid before Parliament detailing the non-observance of the Slave Abolition Treaties by France, Spain and Portugal. In August of each of the subsequent years the Tartar returned home via Jamaica to be refitted, before in the autumn of 1821 she was paid off. During 1823 Collier discovered that he had been pilloried in William James’ great historical work for his failure to capture the U.S.S Constitution, with an imputation of cowardice reinforcing one of incompetence. He rushed up to London from Exeter in a desperate attempt to clear his name, but the Admiralty did little to help him seek a justification of his conduct, and his mental disintegration not only raised the concern of his long-established acquaintances, including Rear-Admiral Sir Edward Hamilton and Colonel John Drinkwater, but also caused his brother, Thomas Collier, to take the precaution of confiscating all of his razors. Even so, overwrought with despair Collier slit his throat on 24 March 1824 in Gordon’s Hotel, Albemarle Street, London, and he died within five minutes, despite the best endeavours of a servant who had been sleeping in the same room to save him. A coroner’s inquest was attended by many naval officers who broke out in applause when Hamilton eulogised on his bravery and exemplary skills, and it concluded that ‘Collier had ‘put a period to his existence whilst in a state of temporary derangement’. Collier married Maria Lyon of Liverpool on 18 May 1805 but the couple did not have any children and his baronetcy became extinct with his death. The address in his will was given as Clyst Saint George, Devon. He was described as a pleasant gentleman and ‘a man of strong feeling and very sensitive’ whom ‘a land historian of the sea made a suicide’. Well-educated, he had many skills including those of astronomy, draftmanship, language and surveying. The Navy recorded that he was brave, experienced, clever and gallant.